Pledge Lemon Clean is ideal for quickly cleaning your wood furniture and wood surfaces, but it can also safely clean other surfaces without leaving a waxy buildup. It dusts, shines and protects your furniture while leaving behind that fresh lemon Pledge scent – for a noticeable clean you can smell, see and touch. 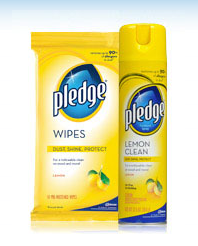 Pledge is lemon scented but other varieties are available. Pledge removes dust and contains Allergen rappers that remove up to 90 percent of allergens found in it. You can use Pledge to grab and remove more dust and allergens and keep them from flying intot eh air when you clean. The Pledge family includes a wide variety of products which can be found on www.Pledge.com/DoMore . Review ~ The day i got this can from Bzzagent I started cleaning everything! I wiped down my tables, desks, Tv's and counter tops! I luved the way it made things smell. I like the way it made my home feel homey and clean. The smell lasted a couple of days after I had cleaned. It didnt leave any smudges or streaks on anything that I cleaned. I will be grabbing more on my next shopping trip! Thanks Bzzagent for allowing me to be a part of this great spring clenaing campaign! It made cleaning fun! Come check out my giveaways, I currently have 7 with awesome prizes! Sounds like something I need to look into!